A team led by Professors Carole Mundell and Iain Steele of Liverpool John Moores University (LJMU) is making great strides in understanding the enigmatic jets produced by massive stars in distant galaxies. These jets slam into gas and dust surrounding the system, producing a sudden burst of energy which, when directed towards the earth, is identified as a surge in gamma-ray emission. This surge is usually spotted first by NASA's SWIFT satellite, which immediately alerts astronomers on the ground who can then pursue rapid follow-up observations with other telescopes. 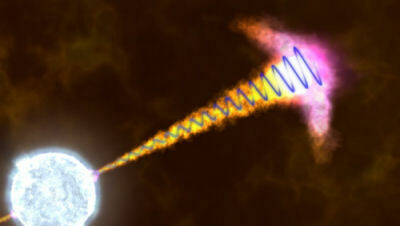 Artists impression of the magnetic field (the blue spiral) superimposed onto a Gamma Ray Burst Jet. It is this helical field which produces the polarisation seen with RINGO2. Image credit: NASA's Goddard Space Flight Center/S. Wiessinger. Gamma-Ray Bursts, as they have become known, are intrinsically the brightest sources of electromagnetic radiation in the night sky. Yet these burst are extremely short-lived, lasting in some cases less than minutes or even much less than a second. The initial burst is followed by a longer-lived though quickly fading afterglow. Rapid response to these events is therefore a necessity - and that's where the LT comes in. 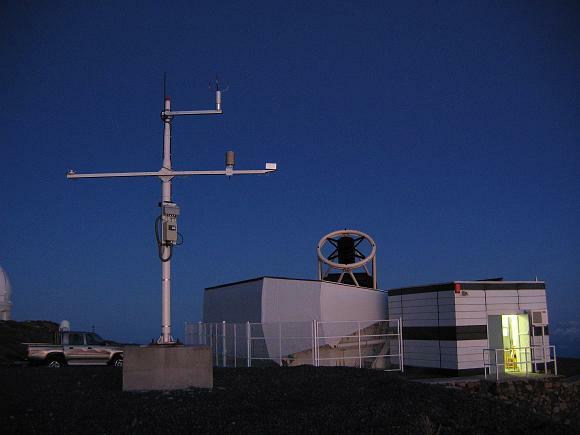 Together with her team, Prof. Mundell has made use of a custom designed instrument, RINGO2, to measure and, importantly, monitor the polarisation of the optical emission from these events. RINGO2 was built by Prof. Steele and his small yet highly talented group of instrument builders at LJMU (indeed, RINGO2 has already been replaced by an upgraded "three beam" polarimeter, RINGO3, which is on the telescope and is currently being characterized). The Liverpool Telescope open and ready to observe. As reported recently in the science journal Nature, the detection of highly polarized light from a Gamma Ray Burst detected in March 2012 (GRB 120308A), and the evolution of its afterglow with time, showed that GRBs contain large-scale, uniform magnetic fields that can survive long after the initial explosion. Previous observations of optical afterglows from GRBs have detected polarizations of about 10 percent. However, these studies provided no information about how this value changed with time. As a result, they could not be used to test competing GRB jet models. Remarkably, the LT managed to slew to and observe GRB 120308A within just four minutes of its discovery. Professor Mundell and her colleagues were able to report the initial detection of visible light with 28% polarization; within ten minutes the degree of polarization had decreased to 16%, although the polarization angle remained remarkably stable. Theoretical models predict the presence of strong and stable polarized emission if the jet possesses a structured magnetic field. Mundell's findings infer the existence of such a globally ordered magnetic field, and therefore support these models. Moreover, the observations suggest that these fantastic cosmic explosions are powered magnetically, like a solar flare, and not by radiation, like the big bang. As well as providing new insight into the physical mechanisms of the most powerful and distant explosions in the Universe, the discovery of highly polarised light from this GRB afterglow may pave the way for future space missions. Conducting measurements similar to those described above - but in X-rays - could be of great value. This could, for examople, be accomplished by fitting a burst monitor and X-ray polarimeter to the recently approved ESA mission ATHENA+. Such a device could be the prime GRB facility for the coming decades.